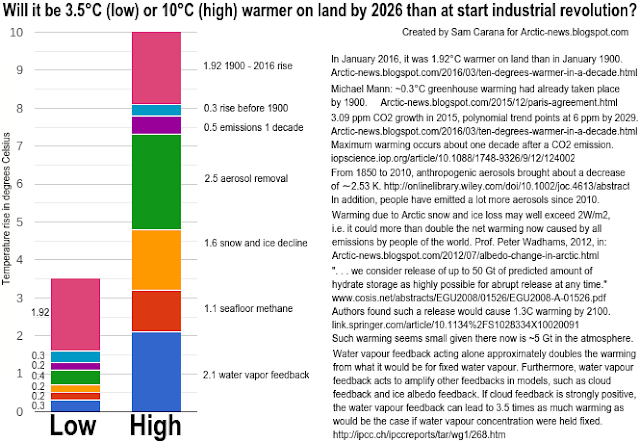 Arctic News: Ten Degrees Warmer In A Decade? Ten Degrees Warmer In A Decade? In 2015, mean global carbon dioxide grew by 3.09 parts per million (ppm), more than in any year since the record started in 1959. 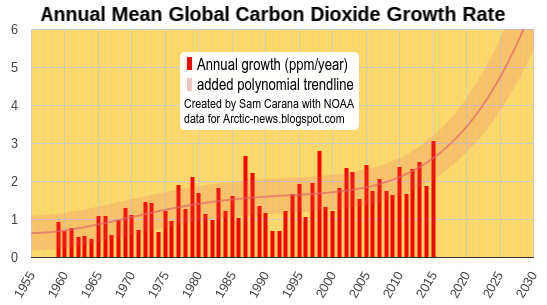 An added polynomial trendline points at a growth of 5 ppm by 2026 (a decade from now) and of 6 ppm by 2029. Rise 1900-2016: In January 2016, it was 1.92°C (3.46°F) warmer on land than in January 1890-1910, as discussed in an earlier post that also featured the image below. Rise before 1900: Before 1900, temperature had already risen by ~0.3°C (0.54°F), as Dr. Michael Mann points out. Rise 2016-2026: The image at the top shows a trend pointing at 5 ppm growth a decade from now. If levels of carbon dioxide and further greenhouse gases keep rising, then that will account for additional warming over the next ten years. Even with dramatic cuts in carbon dioxide emissions, temperatures will keep rising, as maximum warming occurs about one decade after a carbon dioxide emission, so the full wrath of the carbon dioxide emissions over the past ten years is still to come. 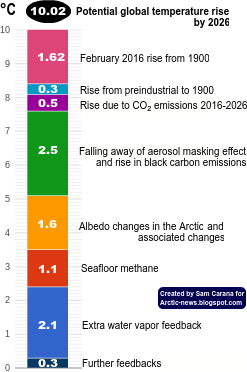 Removal of aerosols: With dramatic cuts in emissions, there will also be a dramatic fall in aerosols that currently mask the full warming of greenhouse gases. From 1850 to 2010, anthropogenic aerosols brought about a decrease of ∼2.53 K, says a recent paper. In addition, people will have emitted a lot more aerosols since 2010. Albedo change: Warming due to Arctic snow and ice loss may well exceed 2 W per square meter, i.e. it could more than double the net warming now caused by all emissions by people of the world, calculated Professor Peter Wadhams in 2012. Methane eruptions from the seafloor: ". . . we consider release of up to 50 Gt of predicted amount of hydrate storage as highly possible for abrupt release at any time," Dr. Natalia Shakhova et al. wrote in a paper presented at EGU General Assembly 2008. Authors found that such a release would cause 1.3°C warming by 2100. Note that such warming from an extra 50 Gt of methane seems conservative when considering that there now is only some 5 Gt of methane in the atmosphere, and over a period of ten years this 5 Gt is already responsible for more warming than all the carbon dioxide emitted by people since the start of the industrial revolution. Water vapor feedback: Water vapour feedback acting alone approximately doubles the warming from what it would be for fixed water vapour. Furthermore, water vapour feedback acts to amplify other feedbacks in models, such as cloud feedback and ice albedo feedback. If cloud feedback is strongly positive, the water vapour feedback can lead to 3.5 times as much warming as would be the case if water vapour concentration were held fixed, according to the IPCC. The image below puts these elements together in two scenarios, one with a relatively low temperature rise of 3.5°C (6.3°F) and another one with a relatively high temperature rise of 10°C (18°F). Note that the above scenarios assume that no geoengineering will take place within a decade. 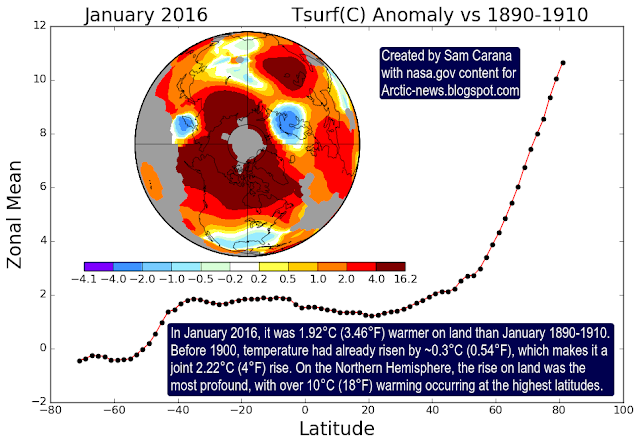 As described above, the January 2016 temperature anomaly on land compared to January 1890-1910 was 1.92°C (3.46°F). Globally, the anomaly was 1.53°C (2.75°F), as shown by the image top right. 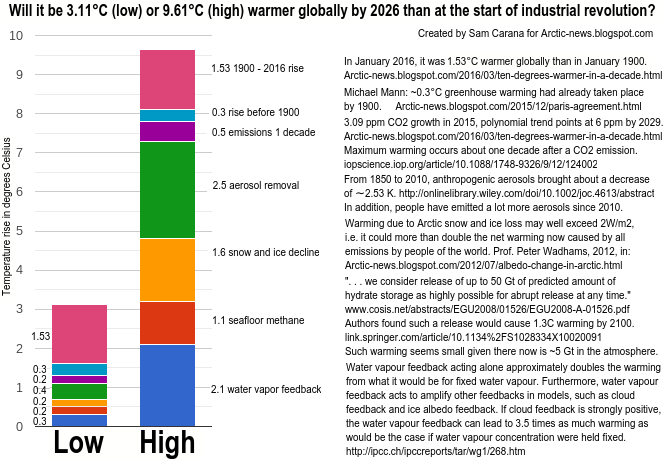 Putting the elements together for two global scenarios will result in a total rise of 3.11°C (5.6°F) for a relatively low global temperature rise and 9.61°C (17.3°F) for a relatively high global temperature rise, as shown by the image bottom right. So, will climate catastrophe occur in a decade or later? There are many indications that the odds are large and growing rapidly. Some say climate catastrophe is inevitable or is already upon us. Others may like to believe the odds were rather small. Even so, the magnitude of the devastation makes it imperative to start taking comprehensive and effective action now. How do you get to 1.92 ? The link provided doesn't work. Yeah, the link only shows what was selected. Go to the NASA site and make your selections. I just wrote an article on my blog looking at the recent acceleration in global average warming. When I started my blog in April 2015, we were at 0'9°C (ish) of global warming over the 1880 average. 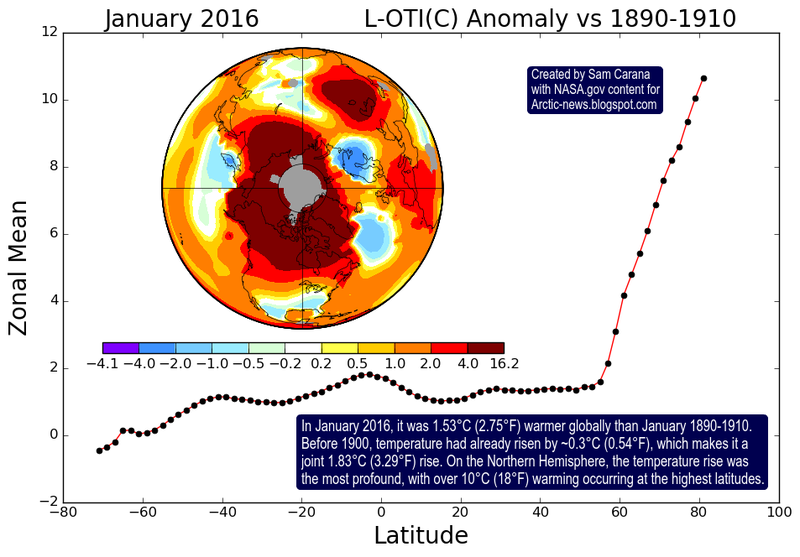 The last 3 months, December 2015, January 2016 and February 2016 are the warmest on record in that order. February 2016 sits at 1,67°C above the 1880'ish average. Some say that satellite inferred temperatures are overly sensitive to El Nino but I'm not convinced of that yet, and it's hard to know by how much. Do you have insights on that? Nevertheless it's a worrying trend even in an El Nino period, we all know temps won't go down but will keep going up ; such a warming wasn't observed during the 1997-1998 El Nino either. Paul Beckwith said that the Arctic has warmed by 5°C and up to 9°C in some areas. Any confirmation of those numbers would be appreciated as my next article will be about the Arctic and what happened there this winter along with the consequences this will bring Southward. Fantastic graphic and post. The realistic outcome is somewhere between the two poles of 3.5C and 10C though there is some indication that the aerosol feedback mechanism is not an instantaneous response but will take some time to 1) move out of the atmosphere, 2) begin to impact the lapse rate feedback over a few years and 3) continue to warm and allow for the water vapor feedback over the next 7 years to increase. So the 3.5C in 10 years is likely a good low value but indicates a rapidly rising value after that. We are in for a very rough ride indeed. 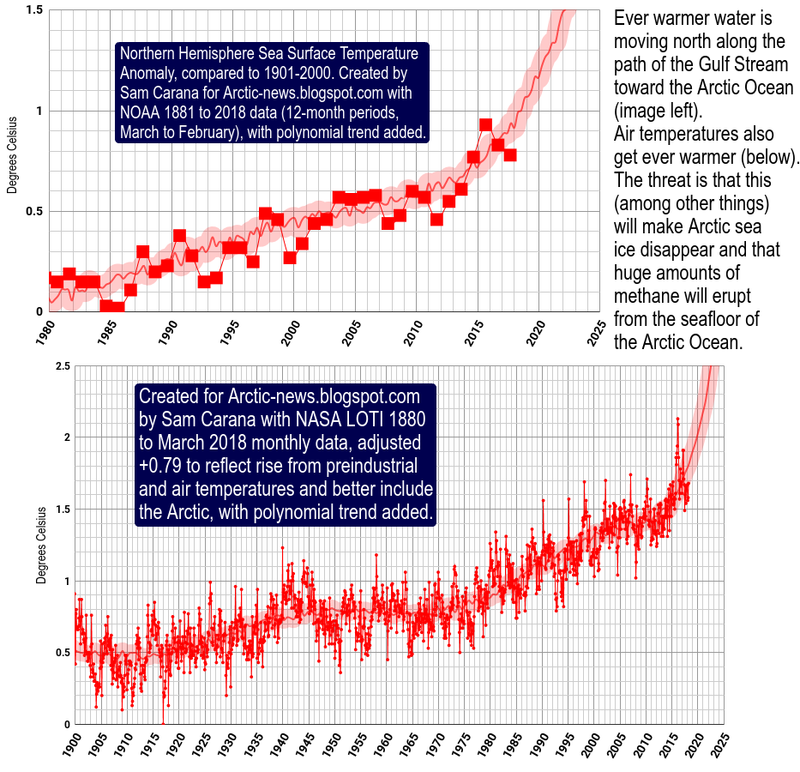 Expect sea ice meltout by September 2019, possibly much earler.